Weston's Jeremy Schwartz, playing first singles, pops the ball over the net during Friday's boys tennis match against Pomperaug. 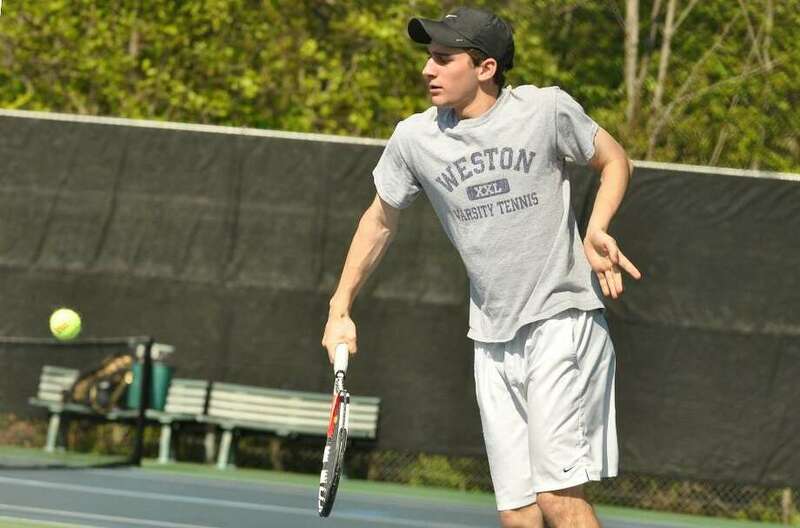 The Weston boys tennis team returned to its winning ways after sweeping Pomperaug at home, 7-0 on Friday. After a disappointing loss at Newtown last Wednesday, Weston rebounded well and showed that it can beat just about anyone when it plays its best tennis. Trojan senior captain Jeremy Schwartz won his match in record time at first singles by bageling his opponent, 6-0, 6-0. Junior Richter and freshman David Freeman won in straight sets at third and fourth singles, respectively. At second singles, sophomore Cameron Hagen battled through to win a tough match in three sets after losing the first set, 6-0. "It takes me a while to warm up usually," Hagen said. "But you never know if your match is going to be the one that wins it or loses it for the team. That's what drives me to stick it out and win a close match in the third set." Although Weston won all four singles and three doubles matches, things can change quickly in tennis and the momentum can quickly swing the other way. Pomperaug's first doubles team and Hagen's opponent each went into a third set and at times looked like they were close to shifting the momentum to their side and possibly beating Weston. Even Richter admitted he had trouble with his opponent who he beat in straight sets, both tie breakers . Schwartz was really proud of how the young team played. He said, "It was a match we really needed to win after our loss to Newtown, and everyone really rose to the occasion. It really says something about our team, that we were able to bounce back after a tough loss last week and get back on the courts and beat a good team 7-0." This year's team is making up for losing eight players to graduation, including first singles player Lucas Andreika, who is playing for the University of Pennsylvania. It is sure to be more of a challenge for Weston to win another Class S championship this year. "We are not going to blow any opponents out of the water," Hagen said. "We lost a lot of good players last year, and we have to be able to win the close matches like we did today." There is still a lot of talent left on this Weston team however. Freeman is a very talented tennis player. Brothers Harrison and Jonathan Lipsitz won their match, 6-3, 1-6, 6-2 at first doubles and Kyle Guerin and Josh Simon won their match in straight sets at second doubles. Robin Willis and Sam Weyrauch won in straight sets at third doubles and showed Weston's depth. Weston defeate Immaculate, who is perpetually in a rebuilding stage, 7-0 at home on Monday.